The Movie Stars Heinsberg at FEDCON - look forward to fandom action! The Movie Stars Heinsberg are a “Costume Group”, which largely build their costumes themselves. Film props also come from their own production. Model specialist Andy Gey brings his detailed and handmade models to marvel at. The construction of his costumes for customers is also impressive. Our prop master presents his most beautiful Star Wars blasters and exhibits from film and serial productions. As a highlight at FedCon 28 the Movie Stars Heinsberg have a Han Solo in carbonite as a 1:1 scale replica in their luggage. The fun in the community of the group and the hobby to introduce other people is in the foreground. 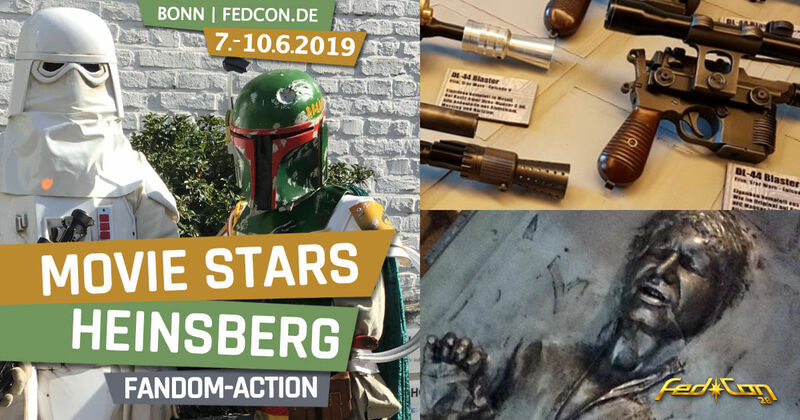 The Movie Stars Heinsberg do not only inspire small and big fans, but they also manage to inspire the audience with their costumes like Batman, Darth Vader, Boba Fett, Deadpool and many more.